The Melting Pot had more to boast about than being the world’s largest fondue restaurant chain. Its cheese fondues are legendary. Its steak, chicken and seafood fondues are unforgettable. And its signature chocolate fondues are sinfully-delicious. But The Melting Pot had a problem: the unique dining experience lasts at least two hours, so traffic into restaurants dramatically dwindles after 9pm. Shirley/Hutchinson originated an innovative solution to this late-night dilemma. The answer was a special prix-fixe menu, offering a selection of chocolate fondues and after-dinner drinks at a very attractive price-point… but only available after 9pm. 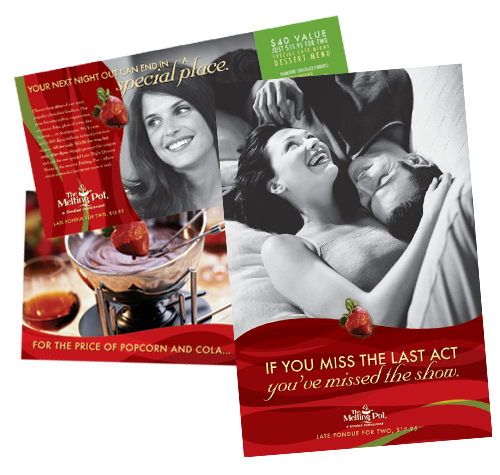 The special offer was showcased with a direct mail campaign, supported by creatively coordinated POP components, a personal e-mail invitation, a uniquely designed in-store menu and discretionary outdoor and radio ads. The Melting Pot expects generated revenues to triple the cost of the campaign – a return on investment we deliver with surprising regularity.